I've been thinking about this topic for a while now and every person I talk to, I tell them that I want to write a blog post about it...so here goes. I'm sick and tired of this notion that there is a singular BIG IDEA out there (unless we're talking Donny Deutsch and a television show). 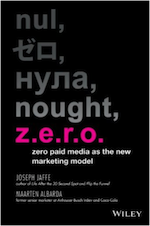 Marketers demand it from their agencies and agencies in turn expect it from media sellers and technology vendors. And they all want it yesterday PLUS no one wants to pay for it. The biggest problem I have with the concept of undertaking on a journey to lampoon the elusive and coveted BIG IDEA is that OUR version of the big idea might not the same as THEIR (meaning our consumers') belief of what is a big idea. A big idea for humans could be paying the mortgage or finding a way to squeeze 15 more minutes out of the day. It could be throwing ball or having a pint of Guinness as opposed to a millions multi-colored balls bouncing down the streets of San Francisco or tracing back our love for alcohol to the dawn of time. Big ideas are equated to expensive ideas...hence the word BIG. They're meant to create a splash; secure buzz; enrapture the masses with pomp, grandeur and ceremony. Big ideas are similarly, full of hot air, fluff, inflated with self-importance, exaggeration and hyperbole; they are obtuse and esoteric and are about as grounded in reality as my avatar in Second Life resembles Arnold Schwarzenegger's physique. I like to think of ideas as sparks or seeds of conversation; each one capable of igniting a raging fire of passion or sprouting a giant, protective Oak Tree. I like to think of many (AN = one of many) small ideas. SMALL = grounded in reality; capable of being internalized, understood and related to on an individual level. Ideas are about potential. As Victor Hugo once said, there is nothing as powerful as an idea whose time has come...but the idea is a catalyst; a conduit; a means to an end...and NOT an end unto itself. Today, the only time BIG IDEAS are means to an end is when that end is winning a new business pitch or a Grand Prix at Cannes. Most new business pitch BIG IDEAS are unimplementable and how many Grand Prix winners at Cannes have gone on to change the world or transform businesses, business models and/or lives. Arguably this year was a sea-change year with Unilever's Dove and the Campaign for Real Beauty cutting against the grain and heading in a different direction. That said, Unilever is also being questioned for talking out both sides of its mouth with Dove and Axe (Lynx) seemingly saying and doing completely polar-opposite things. Yes, two brands and two different target audiences, BUT one company with one culture and one focus which appears to be schitzophrenic. You won't hear me talking about THE BIG IDEA anymore, but rather MANY SMALL IDEAS or AN SMALL IDEA (one at a time please) I'll only use the word BIG when my or your consumer tells me its BIG to them or when I witness the ability for an idea to overdeliver on impact, value and relevance. It's time to get out of the business of desperately seeking the HAIL MARY or GRAND SLAM and focus on SMALL BALL or winning through a series of calculated gains of inch increments. Really glad to see that the Center for Media Research picked up on the SNCR-TWI Surveys research conducted for my book, "Join the Conversation" on Conversational Marketing. Who needs a publicist when you have community generated parody (CGP)? Join the Conversation gets its first UNpromotional video! It's hard to believe, but little infant crayon has just turned one. Not without its diaper rash, eczema, night feeds and spit-up, but equally not without its first smile, giggle, tooth and crawl. One year ago, crayon was launched in Second Life. It was a day I'll never forget. We walked our talk and stuck it out. We dueled with Urizenus Sklar and in the process, become crayonistas and made a friend in the process. We're proud to have done work with companies like The Coca-Cola Company, American Airlines, Firebrand, ooVoo, LaTeen, Luckie & Company, SpiralFrog, GSD&M and many, many more....with hopefully a few more to be announced very soon. Along the way, we said hello and good-bye to a bunch of very special people in our family. To them. To you. To frequent participants in coffee with crayon. To the incredible community that believes so strongly in the power of community, dialogue and partnership - the recipe for conversation. A raised glass and a toast to friendship, loyalty, passion and the pursuit of something better, as we close out the first year and look forward with hope, excitement and anticipation to becoming a toddler. Some feel duped by Radiohead...but for the most part people participated at an average price (or tip) of $8. British website http://www.Gigwise.com has reported that Radiohead sold 1.2 million copies, a figure thought to be largely based on the pre-orders of the album placed in the 10 days between when Radiohead announced the release and the day it went on sale: Oct. 10. I'm not sure if this is referring to their CD sales or purely the digital downloads, but either way it shatters the 300,000 from the band's previous release within its first week of sales. There's also a cool leaked e-mail (who doesn't like those) from EMI's Chairman, Guy Hands. 27m45 - A recap of Bumrush the Amazon.com charts for Join the Conversation, including an apology to Mark Yoshimoto Nemcoff and Michael Yusi, the originators and 3 conversations with Tim Coyne, Evan Keller and Len Edgerly. Mark Yoshimoto Nemcoff, you are my hero! An important Mea Culpa, hat tip, tip jar and request: Chris Penn brought it to my attention that in fact Bumrush the Charts was not his brainchild, but in fact Mark Yoshimoto Nemcoff, in a conversation with Michael Yusi. Mark and Michael, apologies for not giving you the deserved credit. My original plan was to donate the affiliate proceeds from the initiative to charity. My thinking was to donate this to Leo Laporte's 1-laptop-per-child cause...but if you'd like me to rather steer it to continuing to support sending deserving kids to college, just let me know. Also, I'm going to extend this from 1 day (Sunday) to 30 full days i.e. all affiliate sales from Join the Conversation will go to charity. 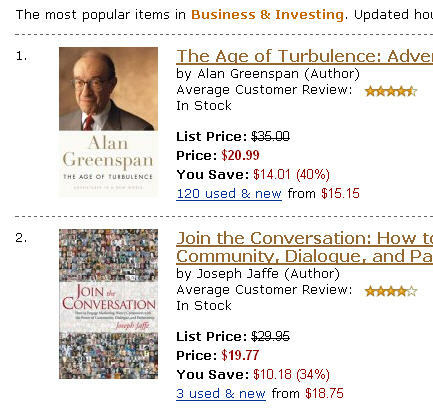 At the peak of the day at 6.22pm, JTC hit #26 overall and #2 in Business behind only Alan Greenspan!!! Thanks to everyone for your incredible support and participation. And if you're still wanting to buy the book, click here! On Amazon.com this morning (Monday, 10/22), "Only 1 left in stock--order soon (more on the way)." 8.52am - #4,840 - I've received acknowledgments from London, Sydney, Belgium and Singapore. 8.59am - 1 hour to go before the "event" kicks off. Still wondering how many people via Facebook actually thought this was a physical event, somewhere in Westport. Don't get me wrong, it's still an event per se, but it's purely digital. 9.22am - #1,813 - #2 in Advertising; #2 in Customer Service and #5 in Accounting (???) - could someone please re-tag this book properly! 5.27pm - #38 overall - WOWOWOWOW!!! This is so incredible. #5 overall in business. #1 in business management, marketing and advertising. Thanks to @normand miron, @kirk skodis, @john wall, @cc chapman, @jay berkowitz, @paul isakson, @jens thraenhart and @drew mclellan. The day is not done, but I'm going to take my foot off the gas now and spend some time with the family. You can still purchase the book if you're just getting home or around the computer to check e-mail etc. I'll check back a little later to see if we're able to keep up the momentum. For now, let me just thank each and every one of you for your enthusiasm, passion and support. I am simply overwhelmed and hope you'll take away from the book what I poured into it. Here's the social media version of the press release. 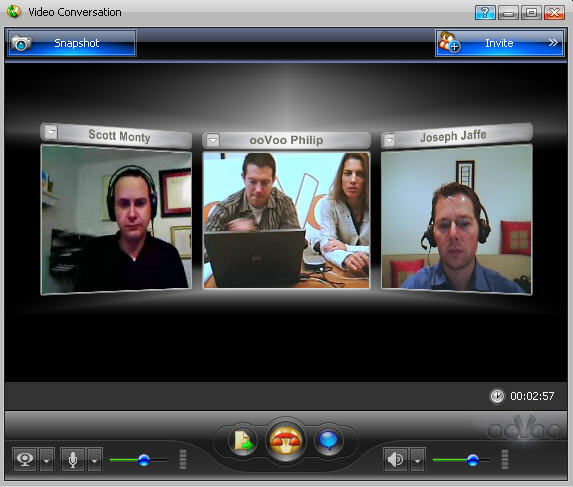 Put simply, ooVoo is a breakthrough video chat platform, that allows free, real-time video conversations. For me personally, the a-ha moment is the ability to engage up to 6 people at the same time on the same screen. crayon will be focusing on influencer outreach, blogger activation, seeding and conversational marketing. To put it to the test and live the brand, I'm going to be using ooVoo on Sunday to Bumrush the Amazon.com charts for my new book, "Join the Conversation." So if you're in front of your computers on Sunday (and have a web camera), download and install the ooVoo software and ooVoo me (my handle is: jointheconversation). I'll be more or less in front of the computer from 10am - 5pm EST. The second is a warning (WSJ - subscription required; if anyone wants to paste a text version in the comments thread, feel free to do so...) from WPP about a 2009 slowdown in advertising, admittedly due to external variables from the Presidential Elections through the housing market slowdown. The third is the topline results from the SNCR/TWI Surveys research conducted on behalf of Join the Conversation about the (continued) rise of Conversational Marketing.